Cem Özdemir is a master of calculated provocations. Once, when asked to defend his support for military aid to Kurds fighting the "Islamic State” (IS), Özdemir told reporters that IS could hardly be defeated "with yoga mats.” Statements like this are quintessential Özdemir: sardonic, quippy, driven by a belief in real politics, with no patience for idealists, including the pacifist wing of his own party. In the election campaign Özdemir shared the party's lead candidacy with Katrin Göring-Eckardt. The duo is controversial within the party, given that both hail from the centrist wing (often referred to as the "realos” — as opposed to the fundamentalist "fundis") - leaving the left wing to feel underrepresented. While most leftists want to categorically rule out forming a coalition with Merkel's conservatives or the pro-business FDP, Özdemir has said that the party would keep its options open, ruling out only a coalition with the right-wing populist AfD. Unlike most people in the Green party - whose voters are predominantly educated, middle-class Germans living in urban centers - Özdemir hails from a working class family. His father migrated to Germany as a "guest worker" during the economic boom in the early 1960s, when the West German government encouraged hundreds of thousands of people from Turkey, Italy and Greece to come take up jobs in Germany because there weren't enough native workers to fulfill production demands of the post-WWII boom. Özdemir grew up in a small town in Swabia, a region in the Southwest of Germany; his home state Baden-Württemberg is known as both a hotbed for ecological activism and conservatives. He joined the Green Party in 1981 at age 15 and received professional training as a child care worker before becoming the first child of Turkish immigrants to make it into the Bundestag (alongside Leyla Onur of the SPD). 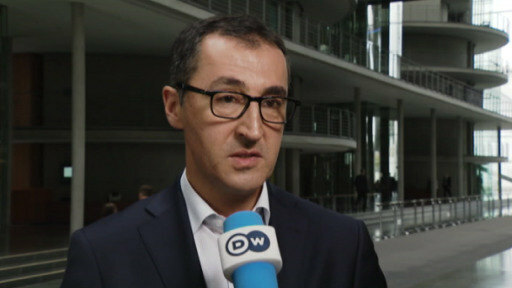 Today, Özdemir is one of eleven Turkish-German Bundestag members. Over his political career, Özdemir has seen macro and micro scandals, both unintentional and consciously provoked. In 2002, he resigned from Bundestag when it was revealed that he had taken a personal loan from a controversial PR manager and lobbyist. In 2004, after spending some time on a research scholarship in the US, he made his political comeback, winning a seat in the EU parliament. In 2013, he returned to the Bundestag. A year later, he was stripped of his parliamentary immunity when he caused a stir with an "Ice Bucket Challenge” video featuring a marijuana plant. When questioned about the incident, Özdemir said that he had consciously placed the plant in the frame, as a "gentle political statement” in favor of the legalization of cannabis, a long-running Green campaign promise. Integration has been a central issue in Özdemir's career. "I want a country where you're not judged by where you're from, but where you're headed. Regardless of whether people have Russian, Turkish, or Swabian roots, everyone should be part of this new us,” he told DW this July. The longtime vegetarian and self-described "secular Muslim” is married to an Argentinian-born journalist, with whom he has a teenage daughter and a seven year-old son. Charismatic, folksy, the first-generation German and self-described "Anatolian Swabian,” Özdemir is in many ways the ideal face for the Green party - a party which has been both hailed and criticized for its bold embrace of multiculturalism - even if his centrist "realo" views have put him at odds with the Greens' pacifist and socialist sections. Turkey is turning into an authoritarian regime, says German Green MP Cem Özdemir, as checks and balances no longer exist. Relations between Germany and Turkey are not bound to become any easier any time soon. 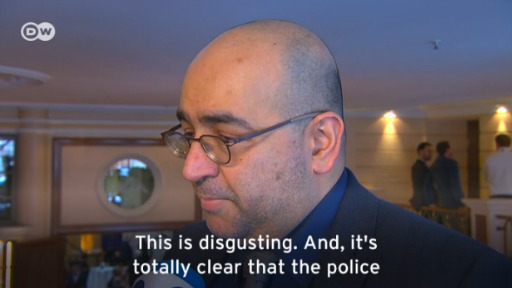 "It's unbelievable and totally disgusting," says German MP Omid Nouripour about the threats to his fellow Green party member Cem Özdemir by security personnel from the Turkish prime minister.